guiding visitors to the monument. The nation’s best-known memorial to the first president of the United States is located in the city that bears his name. At 555 feet, 5 1/8 inches tall, the Washington Monument National Memorial towers over the nation’s capital. George Washington inspired reverence as the man most responsible for gaining the American colonies’ independence from England, as a leader in forming the nation’s government under the Constitution, and as the first president of the new United States. In 1799, “Light Horse Harry” Lee famously said that Washington was “first in war, first in peace, and first in the hearts of his countrymen.” He was not exaggerating. The sleek marble-clad Washington Monument, a major engineering feat at its completion, honors his achievements and unselfish devotion to public duty. Plans for honoring Washington predate his presidency. In 1783, the Continental Congress resolved to erect an equestrian statue in the new national capital, even before selecting a site for the city. Major Pierre (Peter) Charles L'Enfant’s plans for the new city proposed that the statue be located on line with both the White House and the Capitol, very close to where it is now. Washington’s death in 1799 rekindled public interest, but disagreements about what the monument should be prevented any action. In 1833, a year after the 100th anniversary of Washington’s birth, John Marshall, James Madison, and others formed the Washington National Monument Society. The Society held a competition in 1836 to find a design worthy of honoring the national hero. They considered several before selecting architect Robert Mills' design. On July 4, 1848, an elaborate cornerstone-laying ceremony took place, attended by President James K. Polk and other dignitaries, among whom were Abraham Lincoln and Andrew Johnson, both members of the House of Representatives and future presidents themselves. The grand monument took 36 years to complete, delayed by politics, financing, and civil war. 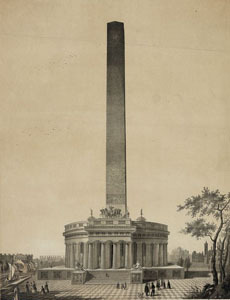 The present monument does not much resemble Robert Mills’ original design, which called for a huge colonnade surrounding the base of a nearly flat-topped, four-sided 600-foot obelisk. The colonnade was to house statues of Revolutionary War heroes and to be topped with a statue of Washington in a chariot. The current location is slightly south and east of the original site selected by L’Enfant, which turned out to be unable to support the weight of such a massive structure. In 1855, the small anti-Catholic, anti-immigrant American, or “Know-Nothing” Party seized control of the Washington National Monument Society through an illegal election, following a dispute over a memorial stone donated by Pope Pius IX. The Know-Nothings retained control of the society until 1858. While in control, the Know-Nothings added just a few courses of masonry to the monument using inferior marble, which were later removed. Construction halted in 1858 when the monument was at a height of 156 feet and the money ran out. It did not resume until after the Civil War. The monument remained unfinished for more than 20 years. Today a distinct color difference is still visible near the level at which construction temporarily stopped in the 1850s. In 1876, the centennial of the Declaration of Independence, President Ulysses S. Grant approved legislation to complete the project, helping to gain public support. With adequate funding and a new design by Lt. Colonel Thomas Casey, of the United States Army Corps of Engineers, the monument was completed within five years with the installation of the 3,300-pound marble capstone in December 1884. A dedication ceremony occurred February 21, 1885. The famous unadorned obelisk Casey designed is the monument of today. Washington Monument to the Lincoln Memorial. The new monument was extremely popular. Over 10,000 people climbed the 898 steps to the observation level in the first six months after its dedication. With the construction of the elevator for passenger use, the number of visitors soared. In fiscal year 1889, an average of 10,000 people a month went to the top. They saw and visitors today still see Washington’s buildings and monuments and a view that averages over 30 miles in clear weather. The 50 American flags encircling the base of the monument represent the 50 States. A unique feature of the Washington Monument is the 193 memorial stones installed on its east and west interior walls. Starting in July 1848, the Washington National Monument Society invited States, cities, and patriotic societies to contribute memorial stones to build the monument. The society required that the stones be durable, quarried in the United States, and of the appropriate size necessary for construction. Due to issues of resource protection and visitor safety, the public receives limited access to the memorial stones, but can view several of them while riding the elevator. Photographs of the memorial stones can be seen in the online photo gallery on the National Park Service Washington Monument website. The Washington Monument, a unit of the National Park System, is located on the National Mall at 15th St. in Washington, DC. Click here for the National Register of Historic Places file: text and photos. The closest Metro stop is Smithsonian station. The Washington Monument is closed for repairs due to an earthquake on August 23, 2011. For more information visit the National Park Service Washington Monument website or call 202-426-6841. 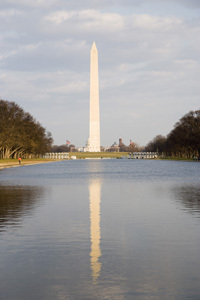 The Washington Monument is the subject of an online lesson plan, The Washington Monument: Tribute in Stone. The lesson plan has been produced by the National Park Service’s Teaching with Historic Places program, which offers a series of online classroom-ready lesson plans on registered historic places. To learn more, visit the Teaching with Historic Places homepage. The Washington Monument has been documented by the National Park Service's Historic American Buildings Survey. 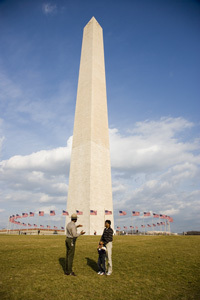 The Washington Monument is featured in the National Park Service Washington, DC Travel Itinerary.